Spokane, WA - The Spokane Indians annual Pitch for the Cure Breast Cancer Walk presented by Mike's Hard Lemonade returns this August! 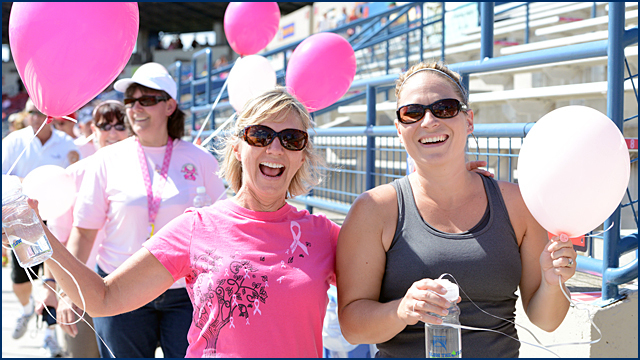 Sunday, August 3rd, at Avista Stadium, will mark the eighth year that the Indians and the Susan G. Komen Foundation have collaborated on the event, with proceeds benefiting the Eastern Washington Chapter of the Komen Foundation. "The Spokane Indians have not only helped us raise much needed funds to screen, educate and get services to women in Eastern Washington, they have help raise awareness and share hope that we will find a cure," said Claudia Bell, executive director of the Eastern Washington's Komen Chapter. "The Eastern Washington affiliate looks forward to this fun-filled evening every year!" The short one-mile flat walk begins at 3:00 PM and circles around Avista Stadium before finishing on the field where the participants will be recognized in a special pre-game ceremony. The game against the Hillsboro Hops begins at 3:30 PM as Spokane players will wear limited edition pink jerseys that will be auctioned off to support the cause. Last year, the Indians helped raise $5,529 for the Komen Foundation. Deadline for early registration is Friday, July 18th, with a late registration fee of $5 after this date. Participants have until the day of event to sign-up. Packet pick-up is scheduled for Friday, August 1st from 10:00 AM to 2:00 PM at the Spokane Indians Team Store located at Avista Stadium (602 N. Havana) and the day of the walk starting at 2:30 PM at Avista Stadium. Click here to download a printable registration form. For more information on the Pitch for the Cure, please contact Walk Director Elise Rooney at (509) 343-6811, or email at erooney@spokaneindians.com. This year, the Indians would also like to invite health care professionals to join breast cancer survivors and their supporters in the Walk. Brave women and men who face a diagnosis of breast cancer do not embark on the journey alone - dedicated doctors, nurses and staff members make it their mission to provide the best possible treatment and care to their patients. In addition to Mike's Hard Lemonade, supporting sponsors for this year's Pitch for the Cure include Itron, Odom, Pepsi, Window World, Team Pilates, Coordinated Care, Rockwood Health Systems, Ross Printing, Rock 94 ½ and KXLY NewsRadio. The Spokane Indians open the 2014 season on Friday, June 13th, against the Eugene Emeralds, and will be televised on SWX-TV. The Spokane Indians would like to thank all of our fans for their support during the record-setting 2013 season. The Indians are the Short Season Class "A" affiliate for the Texas Rangers. Ticket packages are on sale now for the 2014 season, and start as low as $63. Click here for the 2014 schedule. Reserve your seats today by calling the Avista Stadium Ticket Office at (509) 343-OTTO (6886). Parking at all 38 Indians home games are FREE!